You know the saying—April showers bring May flowers. For some of you, spring has already sprung; for others it feels like it will never arrive. Seasonal transitions are rarely smooth, and more than likely your forecast will be calling for rain this month. 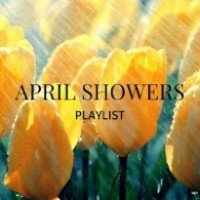 Rather than hanging out on the gloomier, moody side of the rain, get excited with this playlist and a profile to celebrate it. And so, this one goes out to you, April showers. Thanks for abolishing the long, cold winter and ushering in springtime and all its glory. My class loved this last night – I added It’s Raining Men!! Your cueing and descriptions made it very easy to follow. Thank you for sharing!! Thanks, Patricia! So glad you liked it. This has been inspiring: teaching my first class in rainy Oregon tonight! I use Rain in the Summertime by the Alarm (108 bpm) as my warm-up and I Wish It Would Rain Down by Phil Collins (126 bpm) as a cool down. Thanks, Susan! I’ve switched the songs in the profile up many times now and really enjoy I Wish It Would Rain Down by Phil Collins as a cool down, too. It’s perfect at the end of the ride. We’ll add your suggestions, too! Keep them coming. Great playlist and Purple Rain is now available on Spotify. yes! That’s an awesome recent change! Raindrops Keep Falling On My Head – B.J. Thomas. Likely best used for a cooldown. Thanks Lisa! I just added them to the Spotify playlist. LMK if you have more! Thanks Carmen! Just added them to the Spotify playlist. Appreciate your input! Bill, I would like some snow songs! I have spent about an hour looking and I got…nothing! Karen, I love this! My favorite part is the cues…really appreciate getting some new ways to say the same things. THANK YOU! Megan, here’s one for you: Snow on the Sahara by Anggun. Or, the French version La Neige au Sahara. Please feel free to consult with me in the future if you’re in need of songs with embedded wind or hail sounds. I’m working on my songs with snow sounds collection. Hi Bill! I added the ones I could find to the Spotify playlist. I’ll make sure to reach out for our next theme ride, too. Sounds like a winter themed ride is on the docket in Q4!